Shall I Knit You a Hat? fits our Kidsbook Friends theme this week: “The Season for Giving”. Today’s title could be considered a “Guide for Giving a Gift that Fits“. The creativity, consideration, and cleverness that Mama Rabbit and Little Rabbit practice when sharing gifts with their friends will make your ears perk up! Introducing You To Our Featured Friend: Shall I Knit You a Hat? We all love to give gifts that really fit the personality, interests, needs, and even literal size of the receiver. But, the hard part is discovering that gift. When Mama Rabbit heard the news that a big blizzard was coming their way, she knew that the snow wouldn’t stop until it reached Little Rabbits ears. They needed a hat to keep warm too! A very hoppy idea indeed! And the next day, they visited each friend to secretly take their measurements. Little Rabbit distracted the horse, goose, cat and other friends while Mama Rabbit got their sizes. Then back in their cozy home, they began knitting. Little Rabbit came up with all the ideas and Mama helped until late into the night. Just in time before the blizzard, Little Rabbit surprised his friends with their new hats. 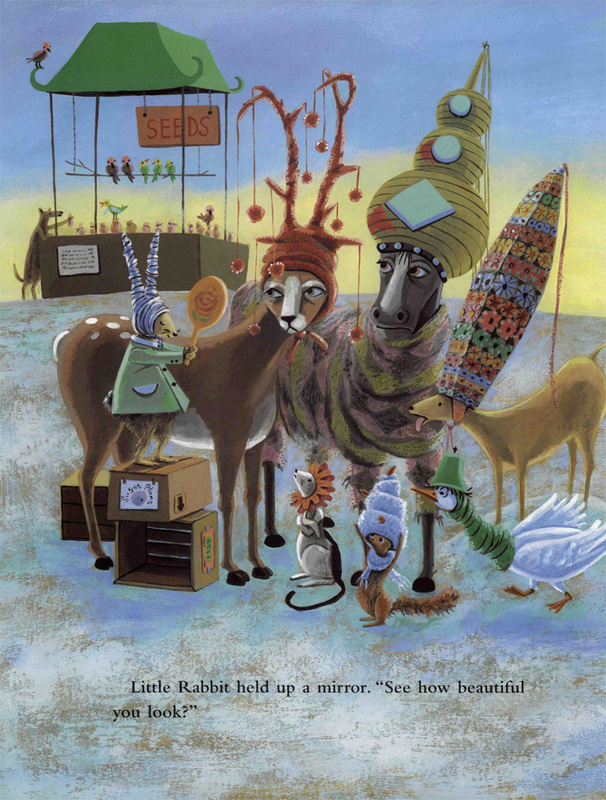 Goose’s hat included a scarf for her neck; Horse’s hat covered his mane; Deer’s hat showed off his antlers . . .
As the snow fell, and they headed home, Little Rabbit realized he forgot to make something for his mama. She reassured him that being with her thoughtful Little Rabbit was all she needed, and they topped off the night with yummy carrot cake! * Consider what gifts you’ve received that have met your needs. * Make a plan of how to make or buy those items for them. * Enjoy the process of getting or making the gifts. * Delight in giving the gifts! F- How do you feel when you receive a gift that is bought or made just for you? R- Can you relate to making or buying a friend a special gift? Tell about it. I- Imagine that you could be any animal in the story wearing the cool, new hat. Which one would you pick? D- Develop a design for a hat for a friend, doll, stuffed animal, or real animal! You can make the hat out of paper, fabric (by either using fabric glue or needle and thread), or yarn. 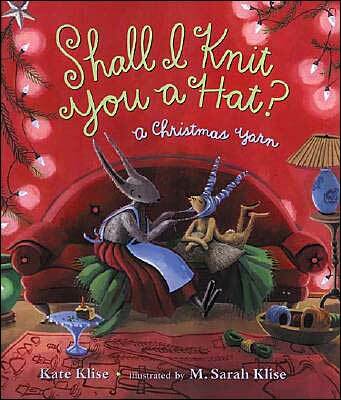 To knit a hat like Little Rabbits, follow the instructions included in the book! S- Share your holiday gifts this year with MUCH love and joy to make the season warm for others! *”Like” Kidsbook Friends on Facebook and subscribe at http://www.kidsbookfriends.com for more kid lit titles with correlating questions, crafts, and fun ideas! This entry was posted in Christmas, Gifts and tagged A Christmas Yarn, Henry Holt and Company, Holtzbrinck Publishers, homemade gifts, Kate Klise, knitting, M. Sarah Klise, Shall I Knit You a Hat, Square Fish Books. Bookmark the permalink. Lovely idea for a Christmas book.